In this extreme heat (a heat few Canadians are prepared for ~ temperatures reaching 40+C) it is important to stay hydrated. 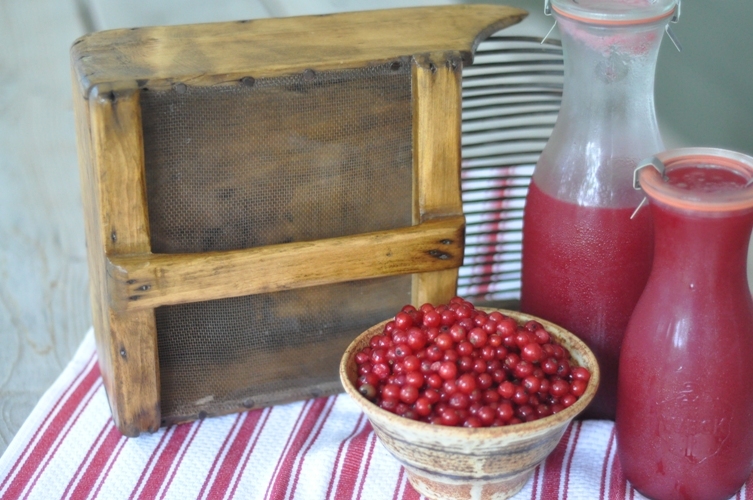 And, what better way to do that than to make your own currant syrup to add both nutrition and extra flavour to water, club soda, ginger ale, or your favorite cocktail. 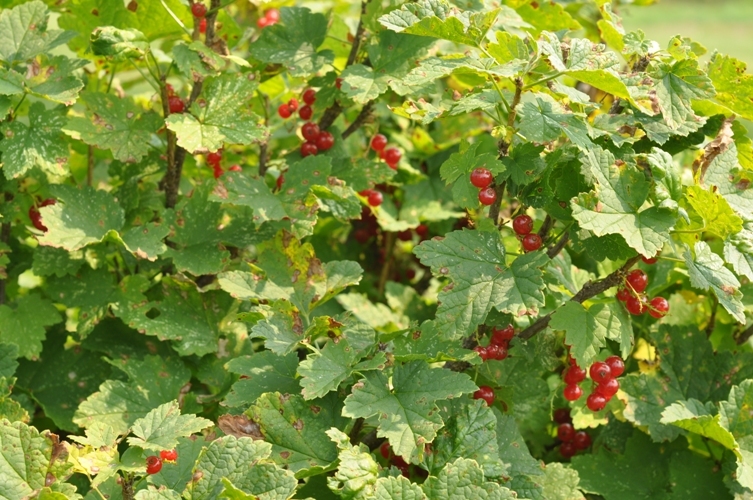 Working in the garden, foraging the fields, and picking berries are a few of the things that add peace to my life. The warm wind rustling the tree leaves, the smell of fresh-cut grass in the air, the birds chirping and singing ~ is there any better way to spend your day!?! Even on these warm days if you start early enough you can get a lot done in the garden before the sun completely wears you out. 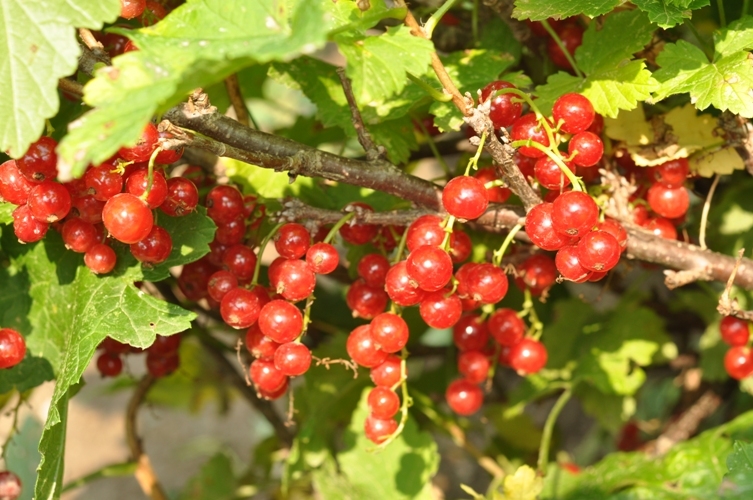 My friends currant bush is overflowing with berries and rather than having them drop off onto the ground she suggested I pick these plump tart berries to savour the flavour. 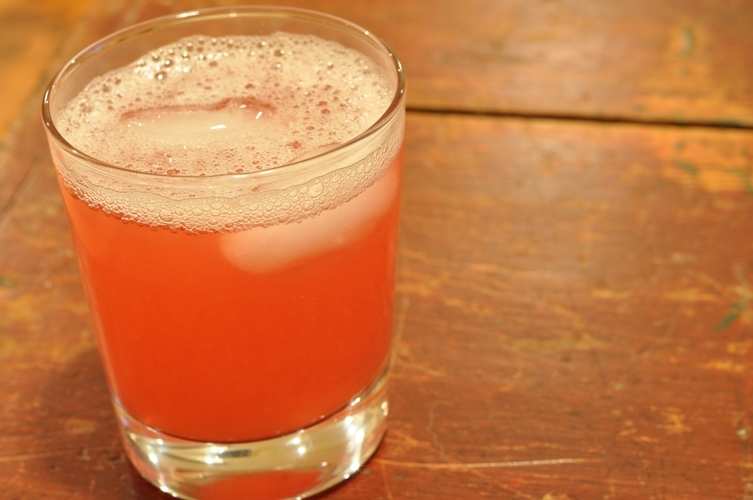 At first, I thought…mmmMMM…jelly but I quickly decided to tackle juice first. Maybe it’s the thirst factor or the heat making you think of all things cool and refreshing but whatever it is JUICE was the first order of business. Prepare for water bath canning OR skip steps 4-9 and simply label and refrigerate to use over the next week or two. Combine all ingredients in a large stainless steel pan and bring to a boil. Boil on high for 5 minutes until currants are soft, mushing them in the pan with the back of a spoon to extract the juice. 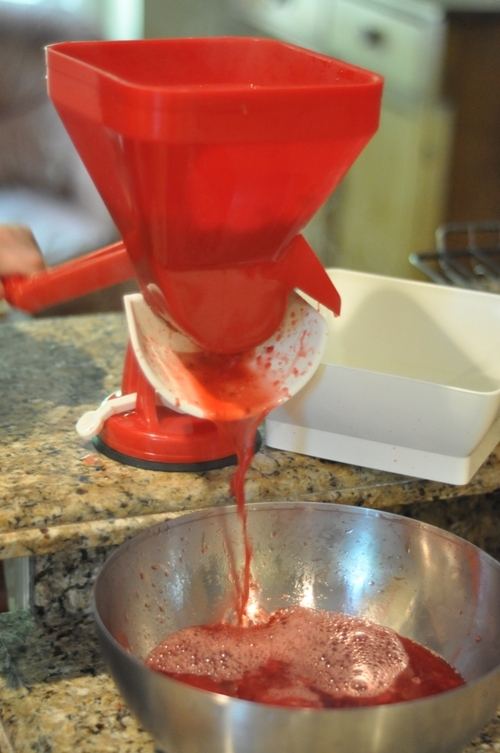 Remove from heat and put mixture through a sieve or a food mill to collect the juice. Strain a second time through damp cheese cloth collecting the juice in a bowl below. Note: if you don’t mind a bit of pulp in your juice it is not necessary to strain a second time. 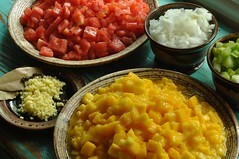 BUT save the seeds and remaining pulp to make a wonderful flavored vinegar and fruit roll ups…posts to follow. Return liquid/ juice to stainless steel pan and bring to boil. Remove from heat and ladle hot liquid into hot sterilized jars, leaving 1/4″ headspace. Remove air bubbles and adjust headspace if necessary by adding more hot liquid. Wipe rims with a damp paper towel. Center lid on jar and screw band down to finger tip tight. Process jars for 10 minutes and in a boiling hot water bath. Remove lid and wait 5 minutes before removing the jars. Note: leaving the jars in the hot water bath rather than removing them quickly will help to prevent siphoning. Siphoning commonly occurs when there is a rapid change in temperature. Let cool, check seals, label, and store. We did not bother to process this juice because (1) we are thirsty and (2) it only made 1.5 litres…which in this heat will be gone in a few days (as you can see from the photo below someone is already dipping into the spoils). 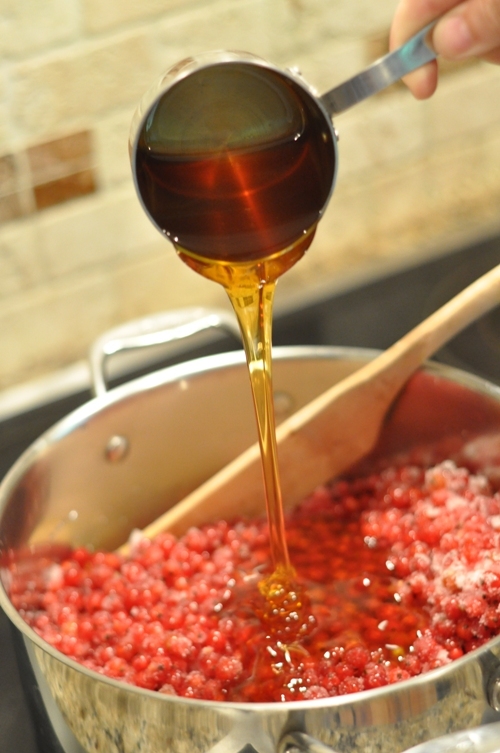 It ended up being a uniquely flavoured syrup high in anti-oxidants and sweetened with honey to combat the natural tartness of the currants. We recommend adding about a 1/4 cup of syrup to every 1 to 1 1/2 cups of water or any other refreshing beverage. The choices are unlimited! Note: A second batch was made yielding the same quantities (1 x 500mL and 1L). ← Pickled Garlic Scapes ~ An Overlooked Ingredient? Your photos are spectacular!! You actually make me think about doing a little canning…that was THINK about. We’ll see if I get farther than that. Oh that looks good! Where did you get those glass bottles with the glass and rubber stoppers? I would love some of them! Are they vintage items? My sister bought them for me for x-mas. They are weck jars and can be purchased in a variety of shapes and sizes. Easy to use and 100% recyclable. What lovely berries. You must have a talent for picking them. I just (coincidentally) made some currant jam last night from berries that I u-picked at a local farm. I mashed so many in the picking process! And had so many stems to pick off before jamming. Not sure I like the product well enough to do it again, but it may be the minute gooseberry thorns that I can’t get out of my fingers that are making me crabby. Did I mention that this u-pick place also has gooseberries? Along with more traditional raspberries, blackberries etc, but currants and gooseberries are a first for me so had to try them.